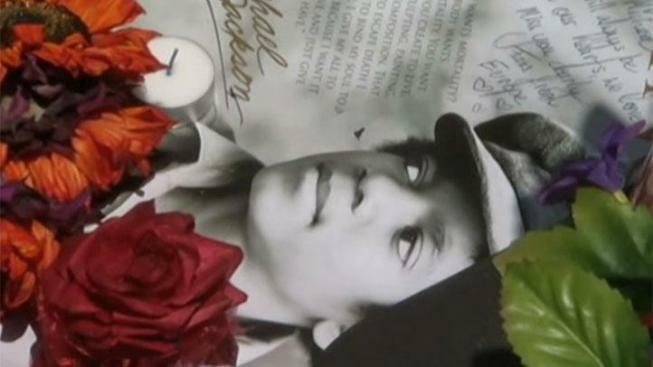 The Grammy Museum unveiled an exhibit Saturday devoted to Michael Jackson on the second anniversary of his death. Featuring artifacts from the peak of Jackson's worldwide popularity, the new permanent display includes two of Jackson's famous sequined gloves and iconic wardrobe pieces including elaborate full suits and beaded jackets. The exhibit, located on the museum's third floor, also includes original costume sketches, ``We Are The World'' sheet music and other memorabilia related to the entertainer. The pop icon died on June 25, 2009, of a propofol overdose. Dr. Conrad Murray is accused of administering the powerful hypnotic to the entertainer to help him sleep, then failing to properly monitor him. Jackson biographer J. Randy Taraborrelli said the family is coping while waiting for the trial. "The family is totally united in that they all agree Conrad Murray is responsible for Michael Jackson's death. ... It's tough. They really lost the heart and soul of the family." Murray's trial on felony involuntary manslaughter is tentatively set to begin in September.